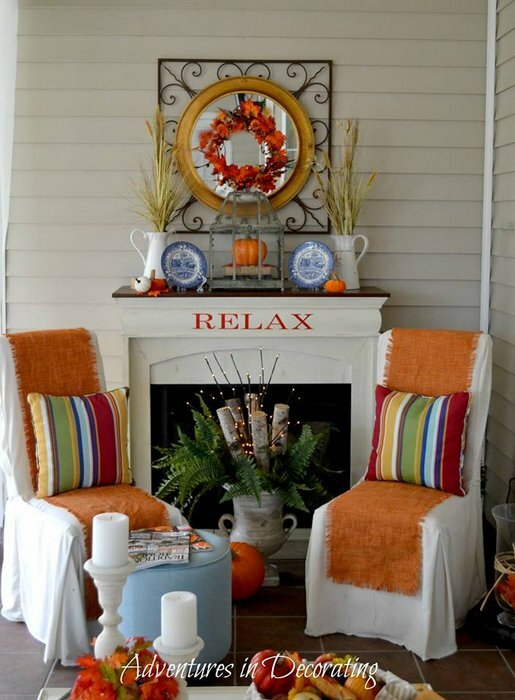 We are honored to bring you 25 bloggers autumn porches. 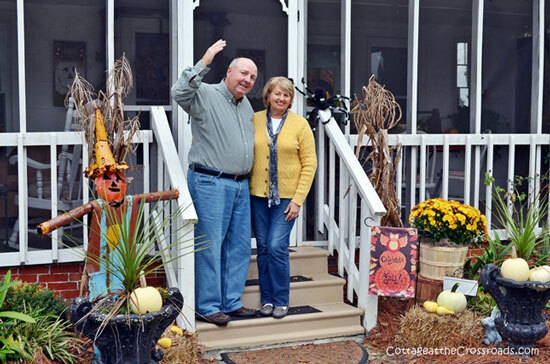 Today we present the second set of five who are sharing their autumn porch decorating ideas with us. The first set of five are here in case you didn't get to see them yet. Our thanks to each of these generous bloggers! If you're like us, you'll love their fresh ideas. She made the pumpkin topiaries in just a few minutes. I like how her urns match her black front door. 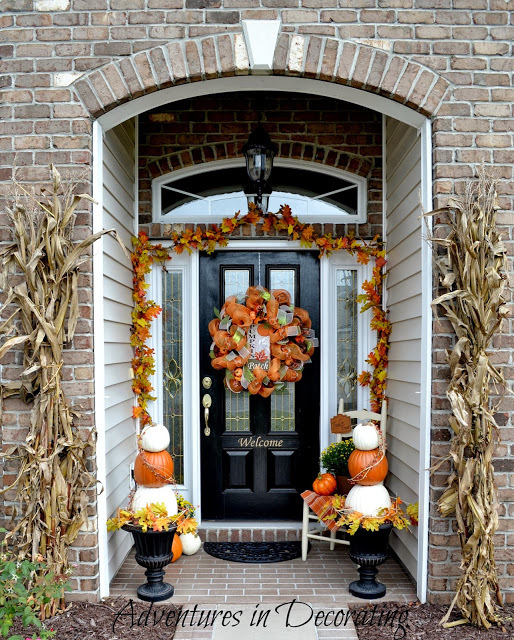 And look at that gorgeous wreath on her front door made of decorative mesh and printed pumpkin ribbon. 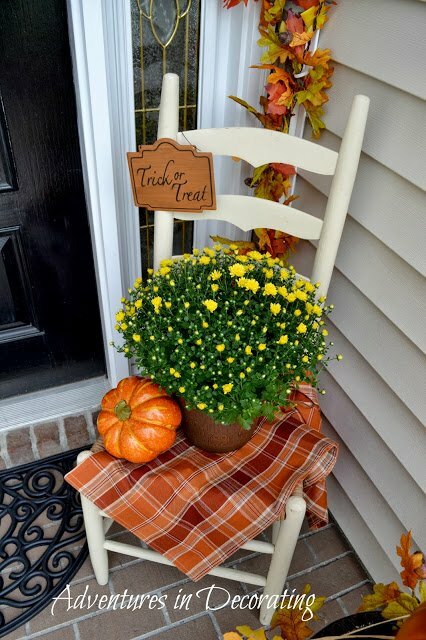 What really caught my eye is that plaid fabric on her ladderback chair and topped by the yellow mum and sweet pumpkin. That is truly autumn essence. 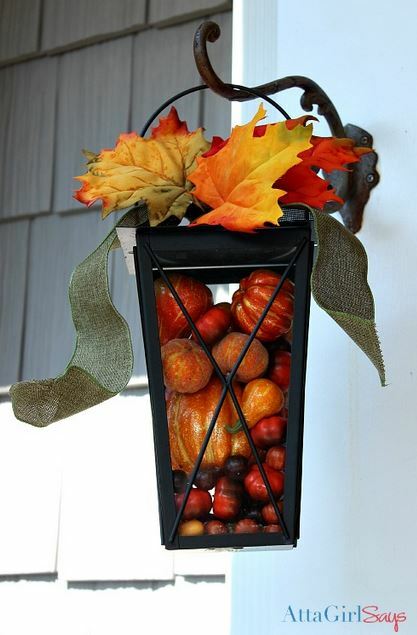 Won't you stop by Becca's blog, Adventures in Decorating, for a complete tour of her autumn porch. And you will see not only more pictures but also how she transitioned her autumn wreath into Halloween with a few simple additions. And one of our favorite spots is Becca's back porch where she has a wonderful fireplace. Isn't this the epitome of autumn decorating? Becca says that the iron art above the fireplace was about to get put into a yard sale until she realized that she could jazz it up with a mirror. That truly turned a tired iron piece into "wow" wall art. A friend of Becca's printed off the letters for "RELAX" from her commercial vinyl machine. You could do something similar with wood or chip board - or stenciling for that matter. And if you wondered, those strips of color on her chairs are actually polyester table runners that Becca had. Almost looks like burlap. 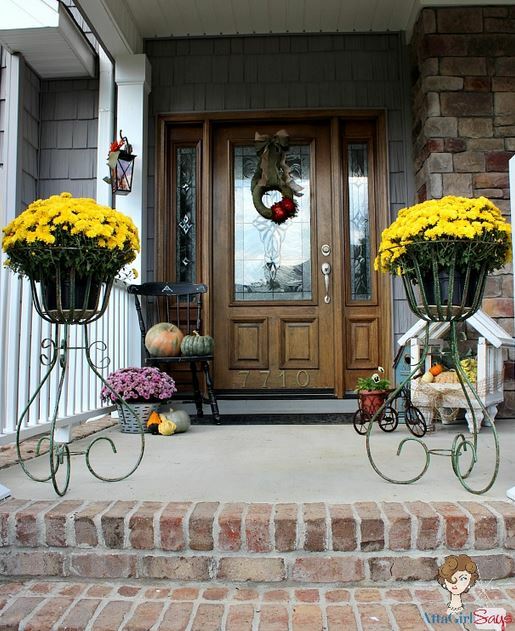 Amy's autumn porch is subtle and inviting with pops of brilliant color here and there. You can bet she had fun pulling this all together! Those vintage planter stands are wonderful. What a fun way to display sunny yellow mums. And look closely at all the touches she added - that vintage bicycle plant holder, blue birdhouse and crate filled with autumn's harvest. A treat for the eyes. Another example of taking something and turning it into another - using a lantern to display a cascade of mini pumpkins. That idea just tickles us. Amy has way more ideas and pictures over at her blog, Atta Girl Says. 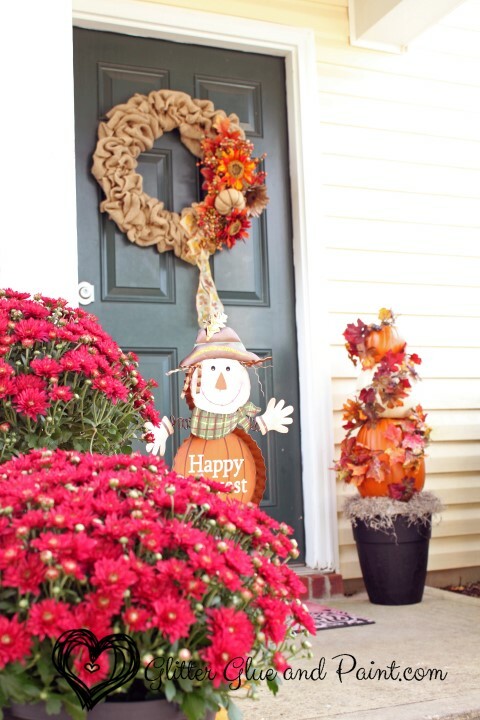 I want you to see the inexpensive and simple wreath ideas that she has for autumn (like the one on her front door). Makes me want to make another autumn wreath. 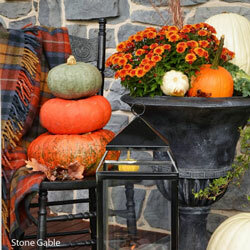 Small porches can have bunches of autumn personality as you see here! Guests are given a warm welcome with the Happy Harvest sign, colorful pots of red mums and that cute pumpkin topiary. Do you see that wreath on Glitter Glue and Paint's front door? 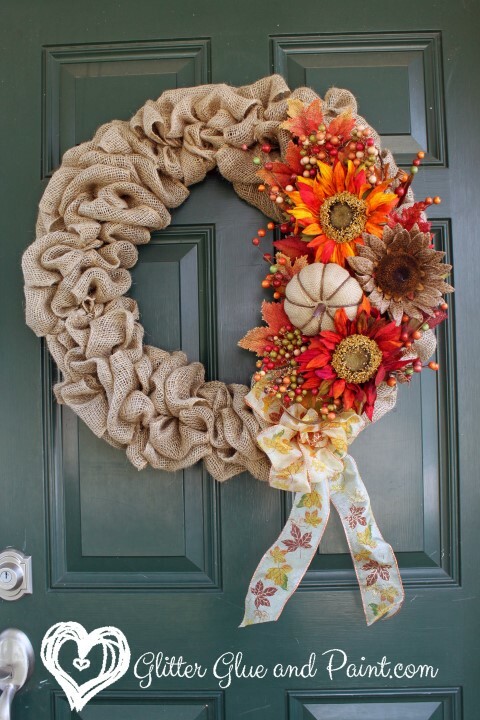 This happy autumn wreath is made of burlap and brightly colored flowers. If you visit Glitter Glue and Paint, she has all the instructions for you. I like the cascade of flowers and placement of that pretty bow. Would love you to visit, Glitter Glue and Paint to say hello to Denyse! Update: As of 3/8/19, looks like Denyse's blog is not available. Ah, we are so happy to feature Leo and Jane once again. Don't they have such friendly faces? I hope you were able to enjoy our interview with them. First of all, I think I would enjoy being Leo and Jane's neighbors. You can just see the friendly warmth in their smiles. 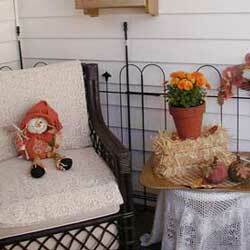 And we can tell how much they enjoy their porches, too, all decorated in such a fun and happy way. 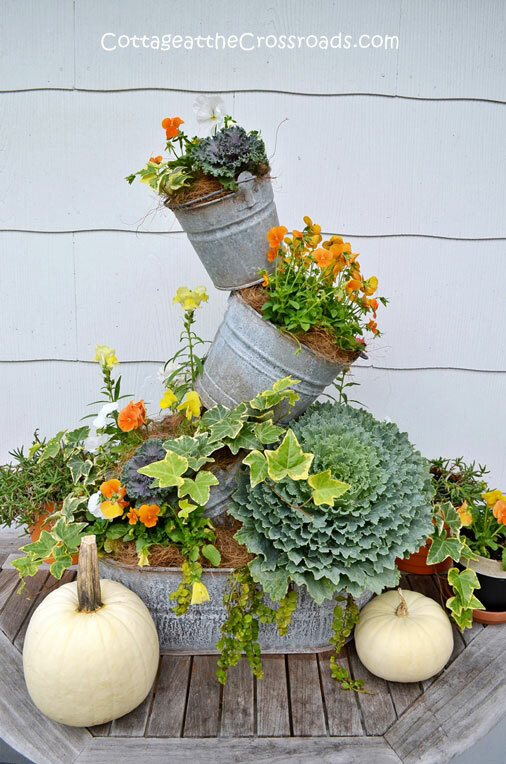 This topsy turvy planter really made us look twice. How on earth did they do this? You can see the instructions on Jane and Leo's blog, Cottage at the Crossroads. Click over because they have a ton more pictures to share with you - even their screened porch. It's an autumn fiesta! Laura of Top This Top That is a true porch lover! She not only loves autumn but also the meaning of porches - a place of comfort, calm and enjoyment. A place where families share time and where you can get away for a little while to just think and ponder. And who would not love her serene autumn porch? Her porch is a wonderful outdoor room, from the comfortable wicker chairs, blankets and greenery to the amazing stone floor and colorful shakes, it's quite an oasis to enjoy. 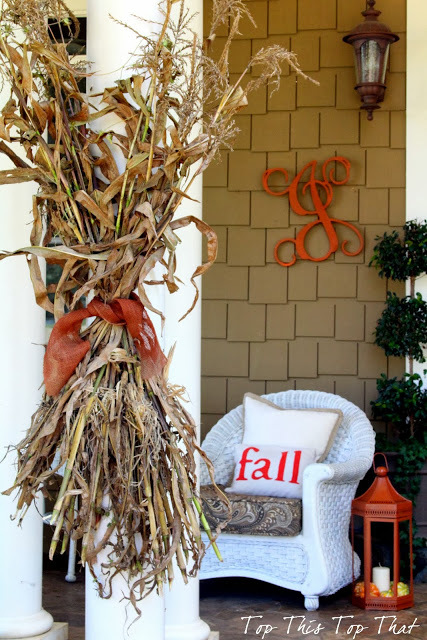 Something as simple as cornstalks tied to your porch columns with burlap ribbon can look amazing. And do you see that pillow? That would be easy to make, don't you think? It's a pop of color and classy statement. Please take a moment to stop by Laura's blog, Top This Top That, to see oodles more pictures. Wait till you see the wreaths on her front doors. 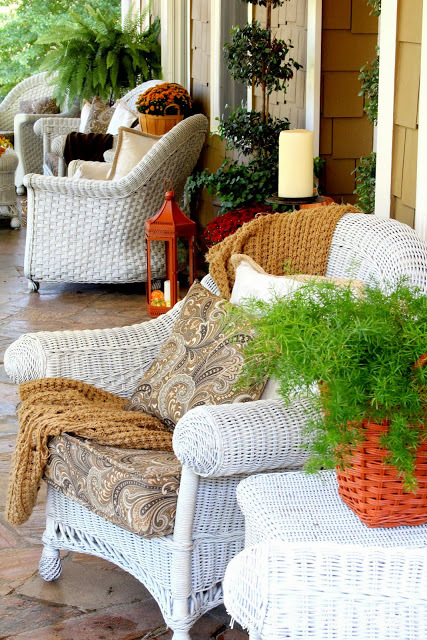 What an honored to feature these 25 bloggers autumn porches with you. We hope you enjoyed these 5 - and there are more to come. Our job is hardly work. Which is your favorite? Our warm thanks to each of the bloggers who generously shared their photos with us here.